As dusk began to fall, I was beginning to despair at my options for setting up my tent. I wasn't having much luck finding a place. Finally, I pulled into a small little town hoping for a quiet spot beside the nearby river. As I rolled through the centre of Masserata, Italy, my fine tuned Canadian ears picked up a familiar noise. Scrattching and scuffing noises seemed to be emanating from a large tent in the centre of the town. I circled around and found the entrance. 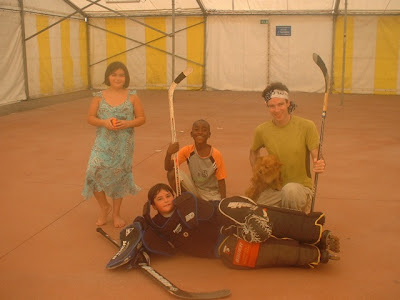 I peaked in, and there, to my vast amazement were kids playing Hockey! Hockey of course is Canada's national sport. I grew up with my Dad flooding our driveway during the Winter so that we could play with our friends on the ice. Back in Ottawa, my little brother and I would play on the street for hours and hours on end. Hockey comes as naturally to my brothers and I as, well... riding a bike! The Italian boy I talked to inside the tent was just as excited to me as I. In fact, so much so that he ran home and got a picture of himself in his hockey gear to show me. At this point, I had headed off on foot to find a camp site, and didn't quite understand why he was running after me. To my amazement, the little boy had told his family about meeting a Canadian and he invited me to his home for some dinner. Ellia couldn't have been more than 9 or 10. The family all gathered around the table as I recounted hockey stories about my time growing up in the frozen Yukon. My Italian is really minimal at this point so much of the xplantion was done with pictures and gestures. 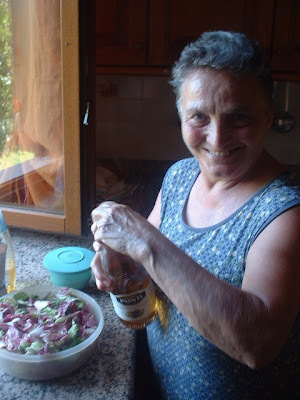 The grandmother treated me to an amazing dinner, the husband to his home made wine, and the wife showed me where I could take a shower. And they let me set up my sleeping gear in their cabin in the backyard. 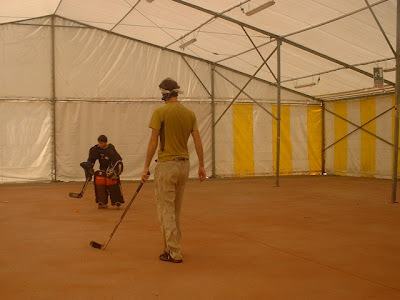 The next day, as promised, we all went back to the arena to play hockey. They had an extra stick for me, more friends showed up and Canada and Italy tied 2-2. The game was aborted because of the crazy heat! Ellia plays goalie... just like I did at his age! His friend Abu spoke French. Through Abu translating, I was able to show him a few goal tending tricks and techniques. When he got home he excitedly told his parents what I had showed him. When the father tried to write something on the paper I had been sketching on, the grandmother scolded him-- they wanted to keep it as a souvenir! There's one thing that we Canadians can learn from the Italians about Hockey. Plant a vineyard outside your arena! There's nothing like coming out of a game all sweaty and hot and feasting on fresch grapes! Wow! What kindness and what an experience! Mum and Dad... watch for a letter in the mail with the grandmother's special spaghetti recipe. Im jealous Russs, sounds like your playing more hockey then me over there!!! Glad to see your spreading Canadiana while indulging in Italiana!